Aside from this obvious pitfall of being a Vestal Virgin of Rome, they still had it pretty good. They were celebrities. The Vestal Virgins of Rome got front row seats at the theatre. 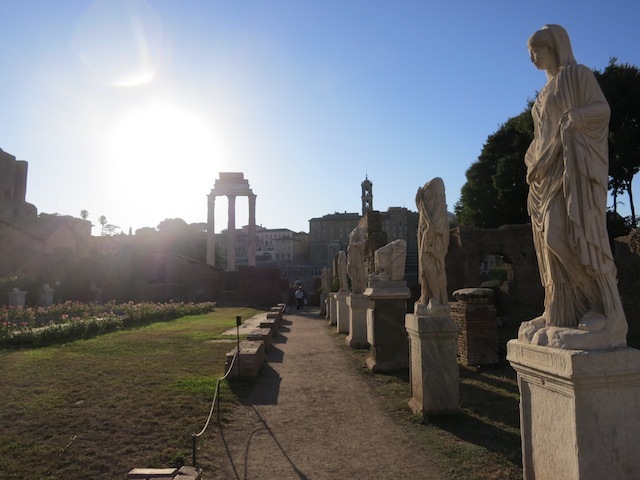 They had a lovely temple, the Temple of Vesta, and a palatial house next to it in the Forum. 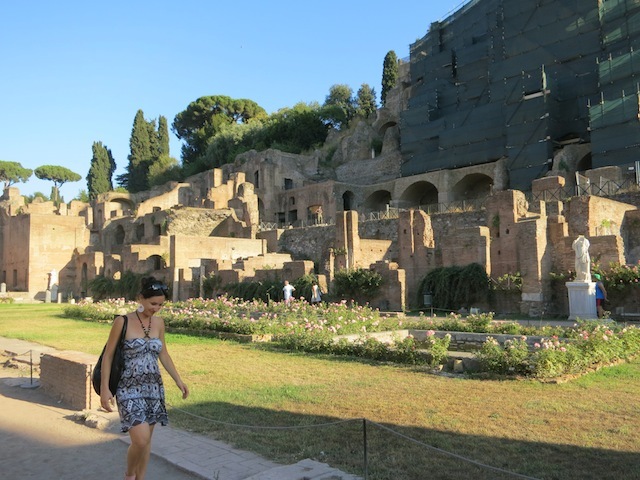 Mark, my fiancé and I just visited the Forum after the excruciating heat of the day had died down. (It’s 36C in Rome today! Yikes! 37C tomorrow!) Actually, even at 6 p.m. it was blistering and we wandered around in the heat and couldn’t find the Temple of Vesta, so Mark finally ditched me to get to the Colosseum before it closed. Personally I think Mark was avoiding the temple to avoid temptation. If a man was caught consorting with a Vestal Virgin of Rome he was flogged to death – and there were no worries about his blood being spilled. 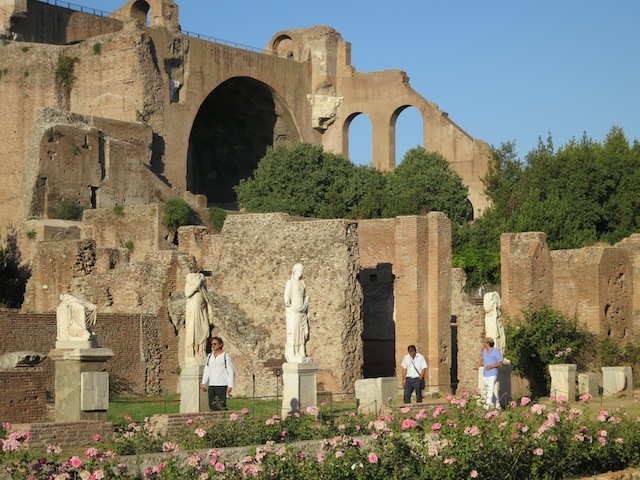 Who were the Vestal Virgins of Rome? The Vestal Virgins of Rome were the handmaidens of Vesta, Goddess of the Flame, also known as Goddess of the Hearth. There were six Vestal Virgins at a time and one of their duties was to care for the Eternal Flame that burned in the Temple of Vesta. The flame represented the everlasting nature of Rome. If the flame were to die out, Rome would be doomed. So, as you can see, the Vestal Virgins of Rome had an important role to play. Careful guys, look but don’t touch! It’s possible Mark was just more interested in gladiators and fighting then in 40-year old virgins. 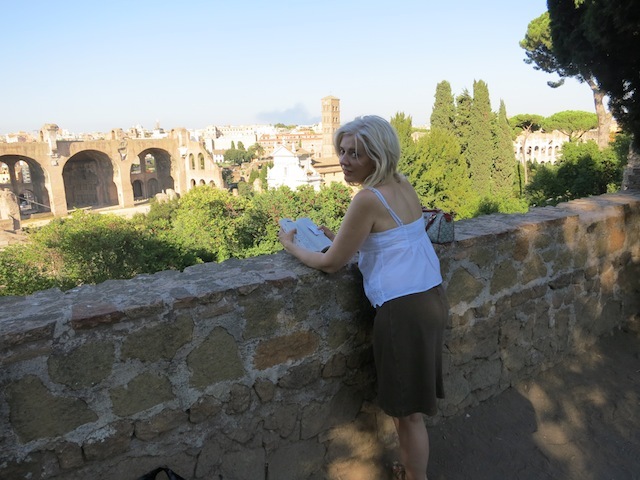 I, however, am in awe of the Vestal Virgins of Rome, and though I’ve been to the Forum before I have never been to the Temple of Vesta or the House of the Vestal Virgins, so I soldiered on – in a very sweaty and cranky way – until I finally located it. It’s not even that hard to find. How did I miss it? I blame heatstroke. 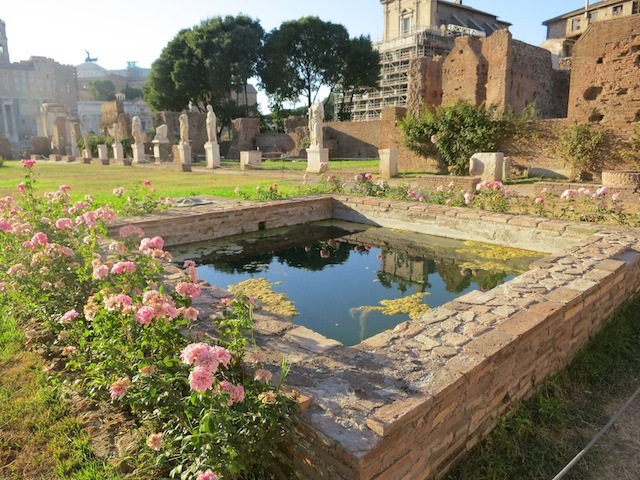 The Temple of Vesta and the grounds around it is such a special peaceful spot in the chaos of Rome, with flowers and pools and statues of famous Vestal Virgins. I tried to imagine the Vestal Virgins of Rome wandering around, stopping to smell the rose petals or stoop to run their fingers through a pool. I wish I knew who the individual Vestal Virgins were. 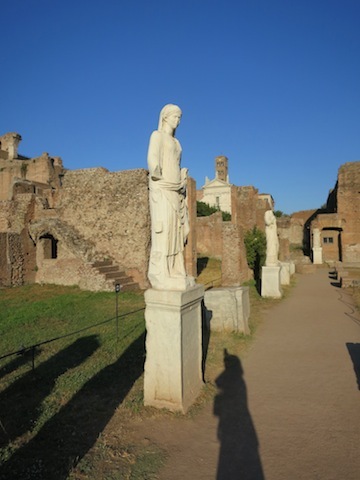 So just who were these famous Vestal Virgins of Rome? The Vestal Virgins were chosen from aristocratic families before the age of 10. 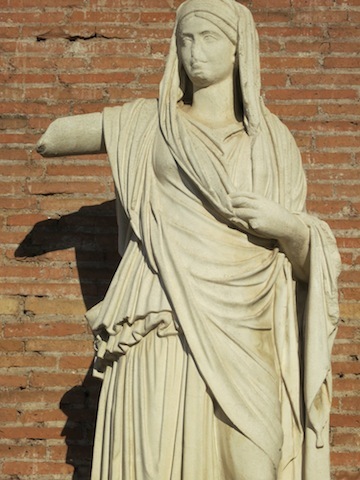 In addition to keepting the sacred fire within the Temple of Vesta burning, the Vestal Virgins also took part in festivals, preparing Mola Salsa, a mixture of salt and flour that was sprinkled on sacrificial victims. Nice. After 30 years of being a Vestal Virgin they were able to marry, and it was a big status thing to win a Virgin – though not, obviously, before her tenure was up. It didn’t matter how old she was or if she could bear children, she was still a prize. And this, if you ask me, is a sentiment that still makes perfect sense today. We’re all prizes, no matter our age. We all deserve prime theatre tickets. And perhaps there is a little Vestal Virgin within each of us. The Temple of Vest is adjacent to the Temple of Castor and Pollux in the southeast of the Roman Forum The Forum is just off the Via dei Fori Imperiali near the Colosseo metro station Line B. 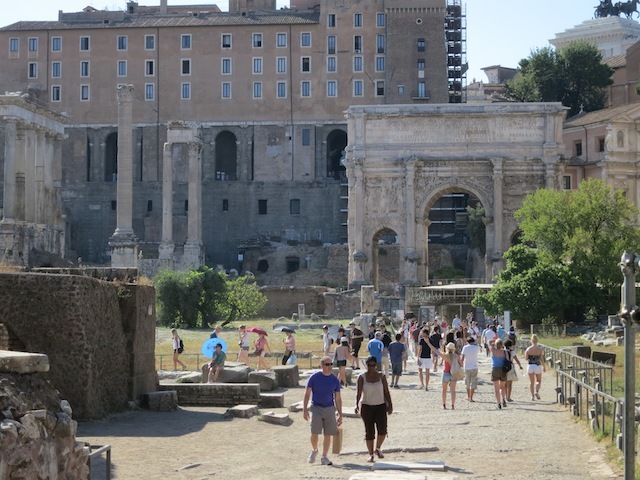 The Roman Forum is open from 9 a.m. to 7 p.m. A combined ticket that includes entry to the Palatine and the Roman Colosseum is €12. Where to stay in Rome: We loved the Rome Cavalieri Hotel. Sorry, that should have read retweeted! 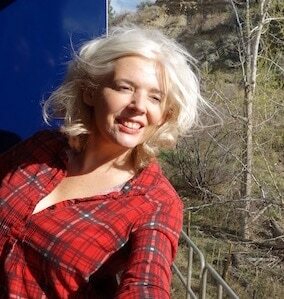 Hi Carol, Your photos have been retreated quite a few times by my followers! I’d love for you to read my book . It’s called Vestal Virgin–suspense in ancient Rome, and it’s available through Amazon. Suzanne, I’d love to read your novel of the Vestal Virgins! 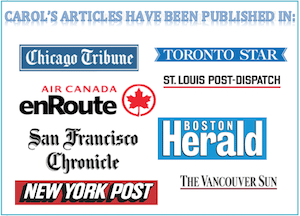 Anyone else wants to check it out it’s called Vestal Virgin – Suspense in Ancient Rome.